On this page we post our Events plus information to better serve our customers. Watch the N.F.L. on Sundays and Monday Nights -- we have food and beverage specials. Starting Nov 6th and every other Saturday Night we have jazz with Henry Strong and Company,6.30 till 10.30 We will serve cheap Martinis these nights. We pay one dollar for every Leaf goal--home games only! Be here to win Leaf Bucks! Our employees play an important role in our business. Friendly service, attractive and always willing to chat. Our customers are very important to us and we take great care in making everyone feel welcome. 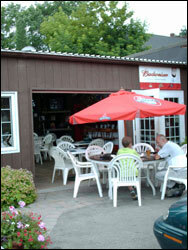 Here is a picture of our patio.